Note: Total fertility rate is the sum of age-specific fertility rates (live births at each age of mother per female population of that age). It represents the number of children a female would have during her lifetime if she experienced current age-specific fertility rates at each age of her reproductive life. 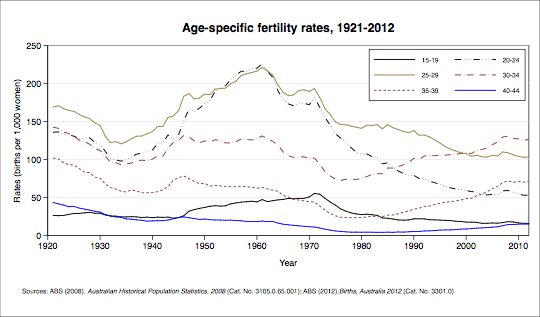 ABS modified total fertility rate for some years in Births, Australia, 2012 (Cat. No. 3301.0). Sources: ABS (various years). 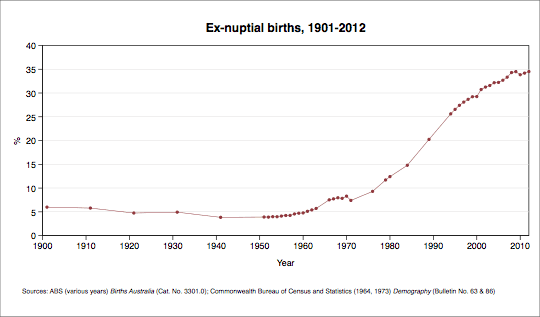 Births, Australia (Catalogue No. 3301.0). Sources: ABS (2008). Australian historical statistics (Cat. No. 3105.0.65.001); ABS (2012) Births, Australia, 2012 (Cat. No. 3301.0). Sources: Lancaster,P., Huang, J. & Pedisich, E.(1994). 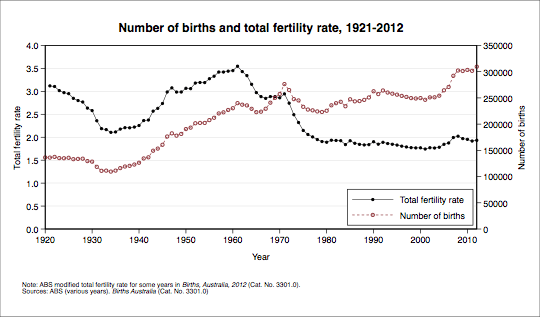 Australia’s mothers and babies 1991 (Perinatal statistics series no.1). Canberra: Australian Institute of Health and Welfare; Laws, P.J. & Sullivan, E.A.(2004). Australia’s mothers and babies 2001(Perinatal statistics series no. 13). Canberra: Australian Institute of Health and Welfare; Li, Z., Zeki, R., Hilder, L. & Sullivan, E.A. (2013). 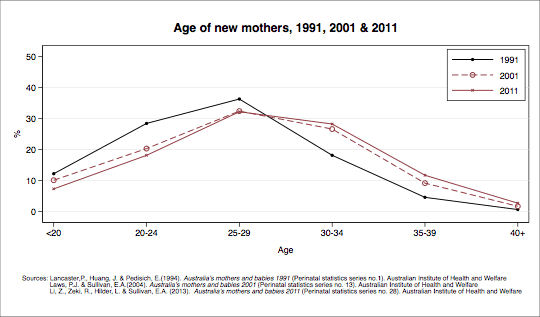 Australia’s mothers and babies 2011 (Perinatal statistics series no. 28). Canberra: Australian Institute of Health and Welfare. Sources: ABS (various years) Births Australia (Cat. No. 3301.0); Commonwealth Bureau of Census and Statistics (1964, 1973) Demography (Bulletin No. 63 & 86).